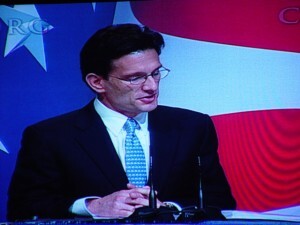 CPAC Live Blog – Day 2 – Saving Freedom: It’s About Jobs Stupid! | Virginia Right! Speaking on the ambitious agenda of the left one year ago, Cantor thanked the activists that for winning the debate on Health Care and other radical programs. Average salary at Dept of Education now over $100,000 per year. Government spending is out of control. We need to focus on private sector jobs. More people need to be concerned about how high their taxes are, not how rich their government benefits are. I am David Hood I really appreciated for this blog, this is woderful openion.